It is possible to distinguish between simple (sugar, honey and maple syrup) and complex (whole grains, starchy vegetables and legumes) carbohydrates. We have learned from scientific research that complex carbohydrates are healthier for you than simple ones . This is mainly because simple sugars digest quickly and raise blood sugar levels rapidly. It is also important when differentiating between several carbohydrates how quickly a carbohydrate will get absorbed into blood sugar (glucose). The index was originally started with diabetics in mind but has become a very important measure for all healthy diets. The Glycemic Index (GI) is a numerical index which rates the amount of carbohydrate in food according to how much the the blood glucose level rises. The GI measures the effects of carbohydrates, with respect to their ability to raise blood glucose, and compares this value with the blood glucose response to different kinds of foods. Glycemic Index values are determined by testing a fixed portion of food and extracting and measuring samples of blood from test volunteers. Usually nutrition and healthcare organizations use High , Medium and Low ranking categories for GI levels in a 100 list. Slower absorbed foods have a low GI rating while faster ones have a high rating GI. How does LowGlc Food benefit a healthy life style? Our bodies need carbohydrate to function and works optimally when glucose is being supplied continuously and blood sugar levels are in a certain range. Therefore, it is very important to avoid an abrupt rise or fall in blood sugar. Low GI foods increase blood sugar levels minimally while high GI raise blood glucose. We have changed some traditional ingredients to a low GI specific formula in our LowGIc Food products to allow for slow absorption. If we want to live a healthy life we should choose low GI foods, like LowGlc Food products. There is much evidence that low GI helps to avoid diabetes, cancer, high blood pressure, high cholesterol, heart disease and keep control the body weight. You can compare conventional ready foods which were made using traditional ingredients with our LowGIc Foods which were made by substituting with low GI ingredients. Our body functions best when blood sugar levels are stable. If your blood sugar gets too low, you can become lethargic or experience an increase in your appetite. If it goes too high, the brain alerts the pancreas to produce more insulin.This rise in insulin then brings the blood sugar level back down, but primarily converts surplus sugar to stored fat. Furthermore, the higher the increase in blood sugar levels, the greater the chance that your body releases excessive amounts of insulin. Increased fat storage is bad enough but with diabetes (diabetes mellitus, types 1 and 2) it is a much more serious problem. The bodies inability to process insulin causes your blood sugar to rise too high and other health problems. Low GI foods containing carbohydrates allow blood glucose levels to increase steadily which means insulin supplies rise gently. Slight increases in insulin can provide energy for hours after a meal and also encourages the body to burn fat as well. For non-diabetics, there are times when a rapid increase in blood sugar (and the corresponding increase in insulin) may be desirable. A high-carbohydrate food is at least 90% carbohydrate and less than 5% by weight of protein and fat. When exercising in a gym or playing a high enrgy sports we can eat high GI foods as we need the increase in carbohydrates. The body has limited carbohydrate reserves which is used up by the amount of energy consumed by the body. Good physical performance and exercise still needs carbohydrate reserves before exercise to ensure a better performance. Why are high glycemic foods bad for you ? Negative changes in dietary habits and sedentary lifestyles have led to an increase in worldwide obesity, with the World Health Organisation reporting 12 percent of the adult population being obese (WHO, 2012). Current estimates from the Food and Agriculture Organisation (FAO, 2012) expect the daily intake of calories to rise from 2803 kcal/capita/day in the late 1990s to 3050 by 2030 (FAO, 2012). Dieticians, health professionals, government and retailers keep pressure on food manufacturers to reduce the calorie value of sugar-rich processed foods. We can find a wide range of substitutes in the market which can be used to replace sugar products. Fortunately due to pressure on food manufacturers, they are now reducing the sugar content or substitute with sweeteners. Sugar-free and low-calorie soft drinks, desserts, dairy products, confectionery products etc. are now more common. Sweeteners much (ten times and even a hundred times) sweeter than sugar are used so only a small amount is required for to produce a sweet taste experience. Why are LowGIcFood and Drink products better for you? 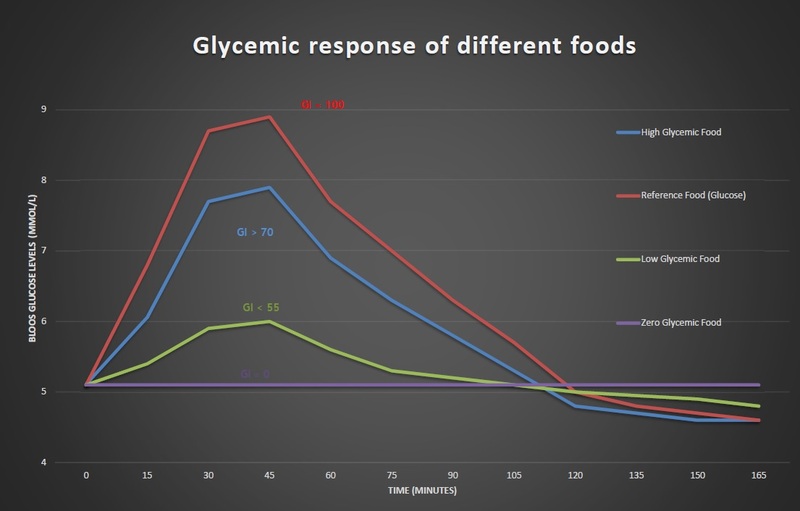 The two main components in food that raise the Glycemic Index are Sugars and Starches. 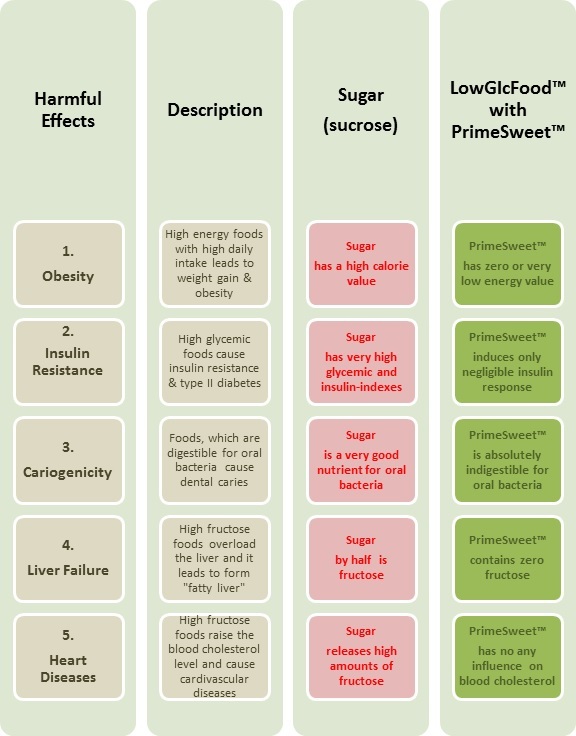 The nutritional concept of LowGIcFood™ is replacing these with healthier low GI alternatives. Here at LowGIc™ instead of using flours with a High Starch content, i.e wheat flour, rice flour, corn flour etc. we are using our own specially formulated Low Carb Flours which substitute the starches with high nutritional proteins and dietary fibres.